Earlier this week, someone made a cheeky discovery on the Bloodborne game disc. But it turns out, this crack isn’t a first. There are even more asinine jokes. Let’s get to the bottom of this! On Monday, Kotaku’s Kirk Hamilton posted this “hidden secret” on TMI. Thank you, Kotaku’s Kirk Hamilton! 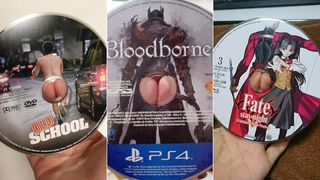 A Japanese Twitter user recently noticed that the disc for Fate stay night: Unlimited Blade Works made a similar visual bum, I mean, pun. Sorry. This comes as yet another Japanese Twitter user noticed something odd with the Old School DVD earlier this month. Can you put your finger on it? Which, I’m sure, are totally on purpose (I’m it’s Seinfeld for crying out loud!). Wouldn’t be surprised if these others were as well.